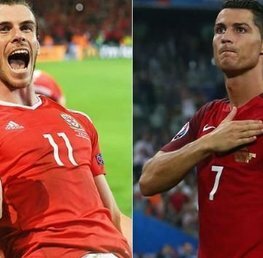 Euro 2016, the biggest European Championships in history, is now underway. Howtobet4free have been busy compiling all of the best Euro 2016 betting offers so you can be armed with the best offers to hit Euro 2016 head on! This page will be updated every day as the Tournament progresses. Betfairsportsbook are offering enhanced odds on Switzerland and Poland in the first of the knockout games in the second round. You can either claim Switzerland at 10/1 or Poland at 8/1 for the respective match odds win (2pm kick off -25th June). Plus Betfairsportsbook also offer new customers £100 in free bets for joining. Betfairsportsbook are offering enhanced odds on Wales and Northern Ireland in their second round Euro 2016 clash. You can either claim Wales at 6/1 or Northern Ireland at 14/1 for the respective match odds win (5pm kick off -25th June). Plus Betfairsportsbook also offer new customers £100 in free bets for joining. Betfairsportsbook are offering enhanced odds on Gareth Bale to score against Northern Ireland. You can either claim 7/1 on Gareth Bale to score (5pm kick off -25th June). Plus Betfairsportsbook also offer new customers £100 in free bets for joining. Betfairsportsbook are offering enhanced odds on Croatia and Portugal. You can either claim Croatia at 8/1 or Portugal at 10/1 for the respective match odds win (8pm kick off -25th June). Plus Betfairsportsbook also offer new customers £100 in free bets for joining. 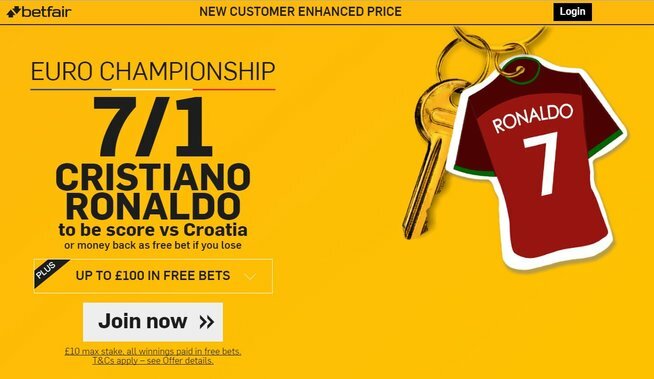 Betfairsportsbook are offering enhanced odds on Ronaldo to score against Croatia. You can either claim 7/1 on Ronaldo to score (5pm kick off -25th June). Plus Betfairsportsbook also offer new customers £100 in free bets for joining. Betfairsportsbook are offering enhanced odds on France to beat Republic of Ireland. You can claim odds on France at 4/1 to win (2pm kick off -26th June). Plus Betfairsportsbook also offer new customers £100 in free bets for joining. Betfairsportsbook are offering enhanced odds on Germany to beat Slovakia. You can claim odds on Germany at 4/1 to win (5pm kick off -26th June). Plus Betfairsportsbook also offer new customers £100 in free bets for joining. Betfairsportsbook are offering enhanced odds on Belgium to beat Hungary. You can claim odds on Belgium at 5/1 to win (8pm kick off -26th June). Plus Betfairsportsbook also offer new customers £100 in free bets for joining. Betfred have a new customer sign up offer running all tournament. If you open an account and bet £10 you get a £30 Free Bet. 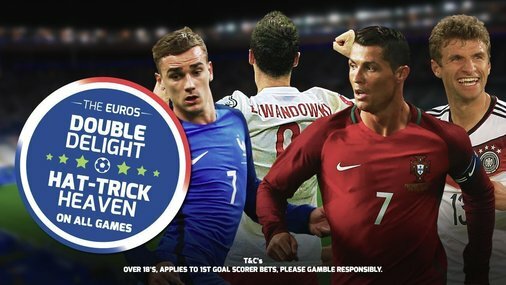 Betfred are offering double and treble odds on your first goalscorer bets on all Euro 2016 games. Double delight means that If your selection scores the first goal, and then scores another in the match, Betfred will DOUBLE your first goalscorer odds! For hatrick heaven if your selected player scores the first goal in the match, Betfred will double your odds, and then if your player scores a hatrick Betfred will treble your odds! Claim Double & Treble Odds with Betfred! Betfairsportsbook have delivered a wide variety of Euro 2016 betting offers. Both existing and new customers get an opportunity to join the fun! The normal Betfair sign up offer which will run all Tournament is Bet £10 and get a £30 Free Bet. Betfair have also built a reputation for some incredible enhanced odds sign up offers which are listed at the bottom of this article. Betfair also have several offers NEW and EXISTING customers can benefit from. Double Odds on Euro 2016 goalscorers who score again – Great offer, place a single bet on selected goalscorer markets and if your selection scores two or more goals, you will get your winnings double as a free bet! For example, if your winning selection at 4/1 scores twice, your profit will be doubled, and thus you will be paid £50 in cash and £40 in free bets. Visit Betfair and claim this great Betfair offer now! 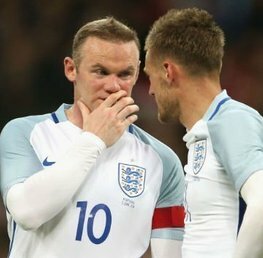 Ladbrokes are offering Money Back as a free bet for all England, Wales, Northern Ireland and Republic of Ireland matches at Euro 2016 if the match ends a draw (selected markets). This offer is open to new and existing customers. Claim your Ladbrokes money back offer!